After living in Savannah for 2.5 years, I finally had the chance to go into this amazing little shop. It always drew my interest when passing by, but it wasn’t until my boss needed copies of a key made that I went in. Upon entering, I was immediately taken back to another place and time. The building smelled like the garage at my paternal grandmother’s house and had a similar vibe. All the walls are decorated with old photographs, and keys and locks from all different eras adorn much of the free wall space. I made two subsequent visits for other copies and kind of get the feeling I will be finding more keys to get copies of. 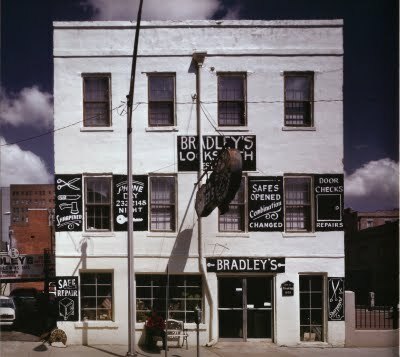 The shop is owned by Mr. William Houdini Bradley, and it is likely that the man himself will make your key copies while you wait, just as his family has done for Savannah for three generations. Everyone in the shop is more than friendly, and they have some comfortable antique chairs to sit in while you wait, but the wait is never very long. Among the interesting artifact collection inside the shop are various safes-one dating from the 1700s, and a set of orange stools that were once part of the Savannah lunch counter sit-ins of the Civil Rights Movement. 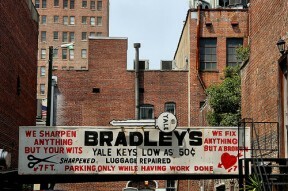 For residents needing a key copied, or even for those just passing through the city, Bradley’s Lock and Key is a shop everyone should visit at least once. Although, once is enough to want to keep coming back. It is places like this that make Savannah such an interesting city. Excellent web site. A lot of useful info here. I am sending it to several pals ans additionally sharing in delicious. And obviously, thank you for your sweat!